fizz freeware for Windows Mobile smartphones, WM2002/2003/2005 phone free downloads. � Summary: Free Software. 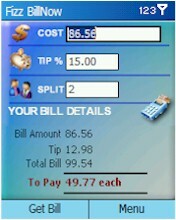 With Bill Now, simply tap in the bill cost, the percentage of tip you feel they deserve and the number of people the bill should be split by.